My friend Patricia is having a baby girl (you can find her here in Pequeno Mundo a 3). Princess S is due in just a few weeks, and as soon as she told us the good news, we (a group of sewing friends) decided to start sewing …. 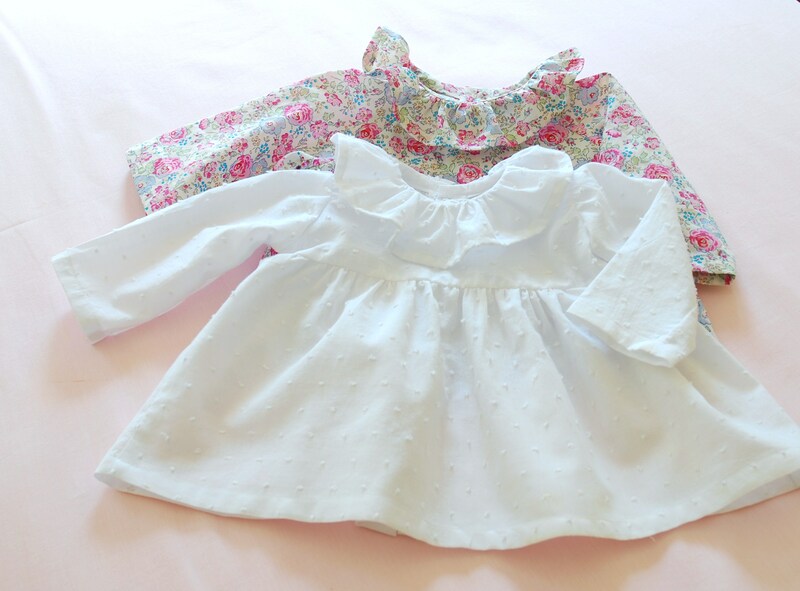 Sewing for a newborn baby is so much fun – everything is smaller than expected (I keep checking if I got my measurements right) and obviously “doll-size” clothes are absolutely adorable. 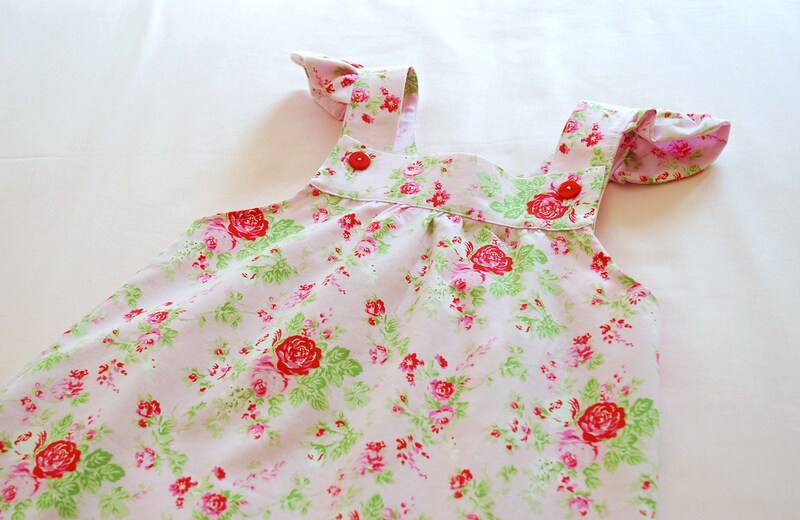 I sew 1 baby dress (crosses in the back) and 2 ruffle neck blouses. 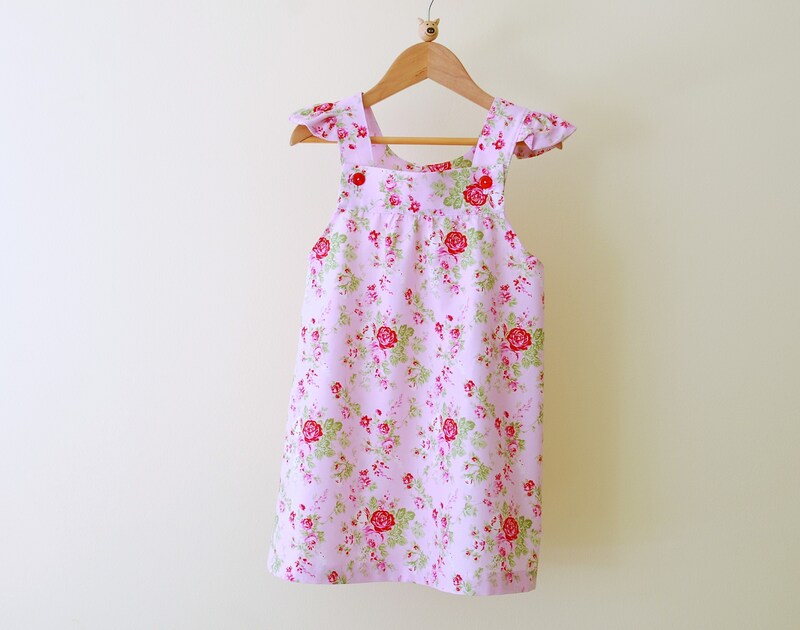 The baby dress was made using the Blandine dress pattern from Citronille, a traditional baby dress that crosses in the back and has a full gathered skirt. It’s a size 3 months. The neck ruffle collar blouses were made from different patterns (both fully approved as I’ve already done these before). The Felicité Liberty version is from Ottobre 4/2012. For this version I skipped the elastic gathering at the sleeves, but other than that I followed the instructions quite closely. I couldn’t resist sewing a white Swiss dot blouse (Myrantine blouse from Citronille). 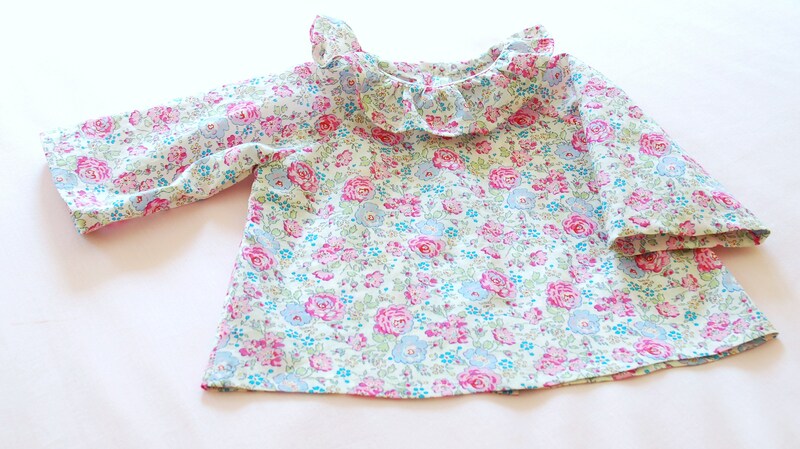 Probably white blouses are not the best options for babies (and I should know better), but this fabric was a dream to work with and I found it perfect for layette sewing. Both blouses are a size 3 months. Patricia’s older girl (Miss C.) is excited to become a big sister and obviously I couldn’t left her out of my sewing plans. 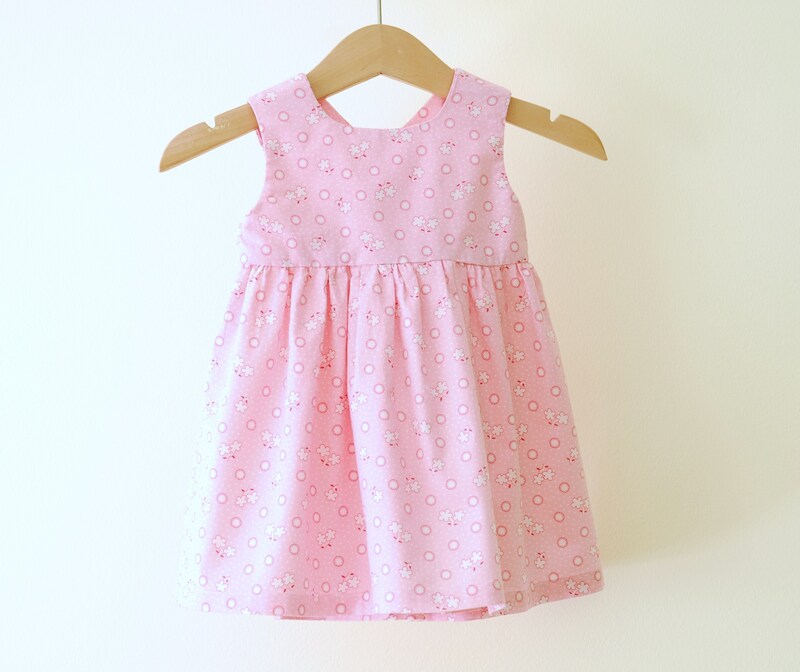 I selected one of my favorite pinafore pattern – the Kokeshi pinafore from Ottobre. This size should fit a 3-years old, but as the fit is quite generous I hope she can wear it for quite some time. For checking everything that will be delivered to Patricia’s doorstep follow these links: Carla, Constança, Inês, Maria João, Magda, Marta, Rita+Fátima, Soraia e Sara. Pingback: Baby Shower | Fairies, Bubbles & Co. Ideal como sempre… Perfeito! Vai ficar um amor a pequena Sara 🙂 Mesmo LINDO! So beautiful Ana Sofia! also a very good taste. That little baby is going to be very elegant. 🙂 Que bom Patrícia! Ainda bem que chegou tudo tão depressa. Obrigada Inês! Não resisti a fazer peças mais “coquetes”. Adorei as tuas – super giras e práticas que é mesmo o que uma mãe com crianças pequenas precisa. (Fala a voz da experiência). Obrigada! Fica o aviso: coser em tamanhos mini, pode ser viciante! Que lindo tudo! Adoro os padrões de flores! I want them all! So beautiful! 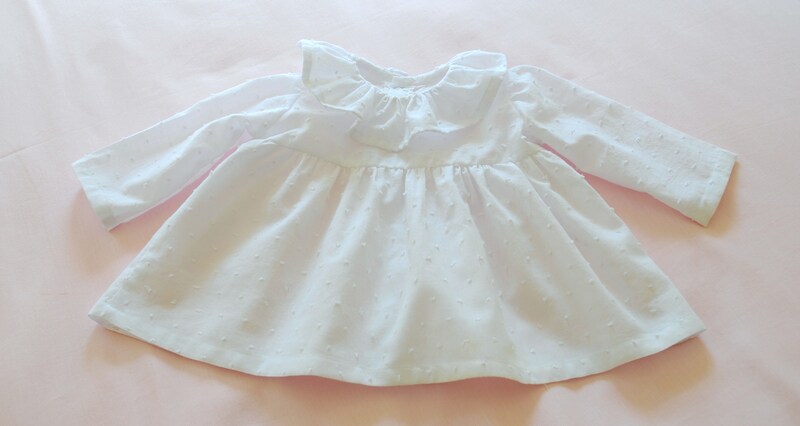 Everything.. the patterns, the fabrics, that light in the pictures… I love you also made something for the big sister. So sweet… ! What a perfect surprise for her, she is so worth this :). Everything you made is so beautiful! Beautiful pieces for baby and baby’s sister:) I am inspired to try a few of the patterns. 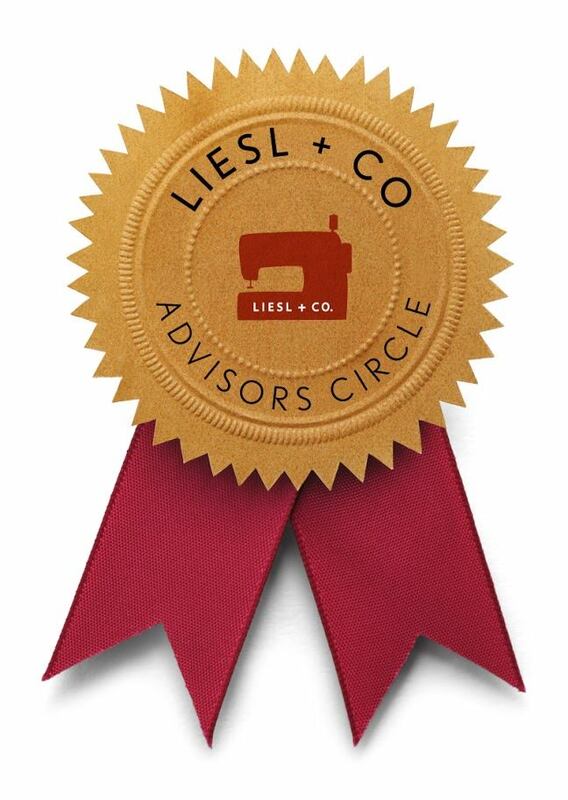 Your sewing is perfect:) So glad you share it on this blog! Tudo tão delicado como sempre Ana. E mais uma vez, gostei tanto da prenda da mana mais velha. =D esse tecido é um luxo. Thank you so much Sarah! I had such a wonderful time selecting the patterns and fabrics for this little surprise. Oh how i wish my friends had your sewing skills ànd taste! Beautiful creations! I love those ruffled collar shirts!! Question: is the ruffle pattern piece a simple rectangle or does it have some curve in it? Thanks!! Já fiz vários destes cá em casa (igual à primeira fotografia) e ficaram girissimos em vários tamanhos desde os 4 anos até ao tamanho 6-8 anos. Este é um dos modelos que mais gosto de fazer e que ficam sempre bem à minha filha Mariana. Tanto como vestido como mais curtos tipo túnica. Gostei de todos mas como já não tenho mais bébés cá em casa gostei muito do que está na última fotografia. Eu também fiz imensos quando a minha filha era mais nova – gosto imenso de os ver vestidos. O vestido da Ottobre é um dos meus preferidos – faz-se num abrir e fechar de olhos e dura imenso (a minha filha chega a usar os dela como túnica, quando começam a ficar curtos …).